Specters of Nevermore is an expansion for Nevermore by Curt Covert, published by Smirk & Dagger Games. It is for 3-6 players. This expansion adds 12 unique character mats, new high quality resolution tokens and a new way to play the game involving the new characters. First off it should be noted that the objectives remain the same as the original game. The first player to 6 victory points or the last player standing is the winner. With that said, we will move on to the one minor alteration in setup. Setup remains unchanged except for one thing, the character draft. Each player is dealt 2 characters face down. They select one and pass the other to the player on their left. Players now scelect a character from the two in their hand. The remaining character cards are returned to the box. Players read aloud their character’s abilities. They then will place their health marker on top of the raven form box. This indicates that the player is in human form. 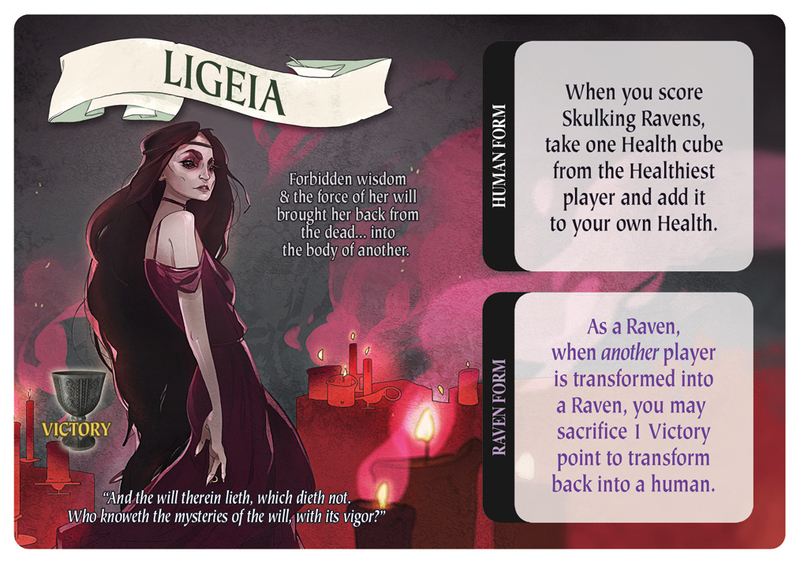 When a player is transformed, they will flip their health token to the raven side and move it to the human form box. One last thing about setup, the new resolution tokens replace the original cardboard versions. Everything else is the same. Now then, let me explain about the character abilities. Several of the new characters have abilities that work all the time or are triggered by a certain event, like being turned into a raven. Some abilities are activated whenever a player chooses. These such abilities are activated before the resolution phase and before Shadow and Light magick cards are activated. This step has been inserted into the phases of play to accommodate the new abilities. Players take turns in turn order choosing whether to activate their ability. If they pass their ability is forfeited for the hand. Once all the players have either used their ability or passed, play continues in the natural course of actions as per the rules. The components for this expansion are exquisite. To start off with, the new resolution tokens are top notch. They are thick clay poker chips with a great finish and design on them. The artwork is pretty much the same as the cardboard tokens from the original game. These are just WAY cooler and better looking. They’re actually quite heavy to boot. Love these by the way. The player mats have the same type of textured linen style finish as the cards do in the original game. It does take a bit off of the artwork but the artwork is so amazing, it doesn’t really even matter. I love Edgar Allen Poe and all his work so to have characters this detailed and beautifully rendered on these player mats is awesome! I absolutely adore the art and I’m amazed at how well each character has been represented, both in art style and in character abilities. Overall, I’m thoroughly satisfied with these additions to the game. They are simply a sight to see. The rulebook for this expansion is rather small and to the point. There are only a couple of pictures, one that explains the basics of the character mats and one that shows the difference between human form and raven form through the placement of the health/raven marker. The rules on how to use the expansion are laid out in a very straight forward manner. There’s nothing that I found to be confusing in any way. On the back of the book there are updates to the rules for those owners of the first printing of the game. Second printing owners already have updated rules. Also on the back of the book is an updated flow chart that shows the steps of gameplay through the different phases. Overall, it’s simple and well designed. I really like the flow chart on the back. It’s small enough and super handy to have when playing the game. Really like the design. As I mentioned earlier, I love Edgar Allen Poe. His literature is so interesting. Nevermore, as I’ve mentioned before in a previous review, is my favorite take that style card game. With the addition of characters from Edgar Allen Poe’s works and some of the most beautiful looking tokens ever, my level of love for this game is through the roof. The character mats don’t add a ton to the actual game play, but they add just enough variety to the mix to make things new and interesting. The characters feel pretty well balanced without one being too overpowered or under powered. However the variety of characters makes each one feel unique and it changes how you play the game, directing many of your choices. The game already had a great Poe feel, but this expansion deeply immerses you into that world. As I said, it doesn’t add a lot but what it does feels just right. For me personally, I can’t see playing the original game without this expansion. It’s a complete no brainer for me. For fans of the original Nevermore game, this is a must have. I highly recommend it. 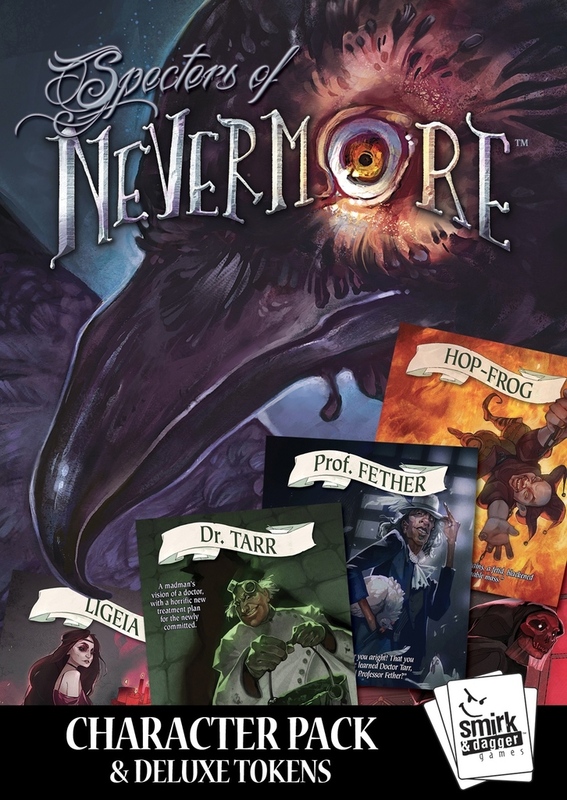 Specters of Nevermore is an expansion for the amazing take that card game, Nevermore. It adds premium quality clay resolution tokens and 12 amazingly detailed character mats from the world of Edgar Allen Poe’s literature. The expansion doesn’t really add much in the way of game time. Most game sessions are still around the 45 minute mark. The components are over the top amazing. The markers are great, as are the character mats. They really add new depth to the game as well as reinforcing more of Poe’s world. The original game was great. I even called it my favorite take that style card game. This expansion makes a great game even better. Fans of the original Nevermore game will love this, especially if they enjoyed the Poe like theme of the game. It is a definite must have in my opinion. I highly recommend it. Quoth the Raven….ah, you know the rest. This entry was posted in Reviews and tagged board, board games, card, card games, covert, curt, curt covert, dagger, games, nevermore, smirk, smirk & dagger games, smirk and dagger, specters, specters of nevermore. Bookmark the permalink.